Played at Masterton Pétanque club. Claire Bradburn (Silverstream)/Tommy Werry (Park Avenue), Sharon Cannon (Bay View)/Yvonne Futcher (Wanganui East), Jan Hayward/Shirley Peard (Horowhenua), Susan Norman (Windy Hills)/Shirley Selwyn (Wanganui East) 5 equal. Kath Alison/Fay Doyle (Kapiti), Diane Brunton/Clare Loman (Otaki), Barbara Frampton (Kapiti)/Joan Judd (Otaki), Linda Gazzard/Jo Maxwell (Kapiti) 5 equal. Sharon Cannon (Bay View)/Yvonne Futcher (Wanganui East)/Claire Wilson (Masterton), Rachel Gorniot (Wanganui East)/Shirley MacDonald (Horowhenua)/Margaret Mordecai (Otaki) 3 equal. Kath Alison/Fay Doyle/Linda Gazzard (Kapiti), Leeanne Bird/Sandra Carston/Sheryl Parslow (Wanganui East) 3 equal. Format: Two pools of six playing a round-robin. Playoff between similarly ranked team. Played at Silverstream Pétanque club. 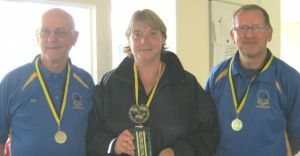 Diane Brunton/Mike Towart/Bob Wilde (Otaki) 0.